Tsekelewu community is one of the ten Ijaw communities that made up the Egbema clan in Warri North, Delta State. It is situated in a boundary between Delta and Ondo state and is blessed with abundant deposits of crude oil within its environment. It is host to Chevron and Shell Petroleum Development Company since the 1980s. Apart from several oil wells and pipelines crisscrossing the environment, Shell’s Opuama Flow Station and Chevron’s Opuekeba Flow station that flare gas are located in the community environment. A third oil company, Sahara Energy has also concluded an Environmental Impact Assessment [EIA] with a view to operate at Tsekelewu Marginal Field. In 2011, the local organization Environmental Rights Action (ERA)’s attention was drawn to the plight of Tsekelewu people, as they have been forced to contend with the adverse impacts of canals constructed from the Atlantic Ocean by Shell and Chevron to access their oil facilities. These canals that were constructed in the early 1980s have adversely affected the ecosystem, poisoning water and vegetation and by extension, livelihoods. Chief Wilson: "Following our cries, the Niger Delta Development Commission [NDDC] awarded contract in 2004 to a company to dredge the Creek and save us from the hardship we experience, but the company did very little or nothing and disappeared. We took the matter on with NDDC and the company concerned. Up till now the matter is still in court; we have spent so much money borrowed outside the community. It is as bad as that. 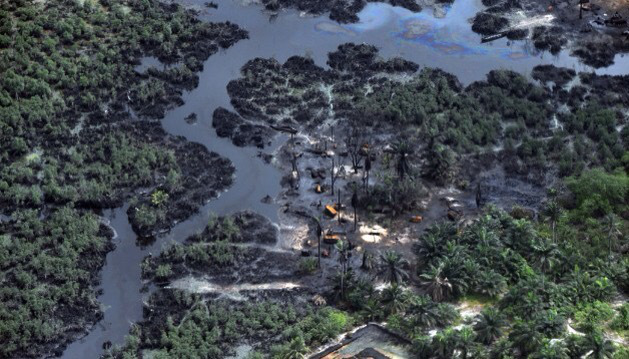 NDDC told us that about 35 per cent of the dredging was done. But we were surprised how they calculated 35 per cent and, from where or what?” Mid-West E.K [Esq]: "Our fathers actually opposed the canalization project of Chevron and Shell. But, the companies brought in Mobile Police to intimidate, beat and arrest them. They took our fathers to Ondo state where they were detained and made to go through harrowing experiences. That was how they silenced our voice and have subsequently forced us to suffer untold hardship and denial of livelihood. This is our plight. “ OBSERVATION/CONCLUSION of ERA field visit: ERA monitor observed that the negative impacts of the canalization in Tsekelewu Community has caused grave economic, social and environmental hardships and is now beyond the capacity of the people to solve. ERA’s field monitors observed that, apart from the shallow Creek which affected the engine of the speedboat that was used during the field trip, large expanse of impacted land is now lying waste, with little or no trees in the environment, when compared to other communities. Indigenes were noticed returning conveying drums of water on canoe [from the oil company facilities away from the community], a very tasking activity for both men and women. The community is also in dire need of development as there is nothing to show for the oil wealth derived from the community environment. 1 The Federal and State governments compel Chevron and Shell take prompt steps to remediate the environment and compensate the people. 3 Shell and Chevron dialogue with the community to avoid violent conflicts as a result of their (oil companies) actions which have created problems for community folks.